The PRCA stand in the line of historic Christianity, believing and confessing the basic truths of the infallibly inspired Word of God. This is “the faith… once delivered unto the saints” (Jude 3), the “traditions” handed down to us by Jesus Christ through His apostles and prophets (Eph.2:20; 2 Thess.2:15). These basic Christian truths are summed in the great ecumenical creeds of the early Christian church including the Apostles’ Creed and the Nicene Creed. These fundamental truths center on the Triune God and His great works: God the Father and our creation, God the Son and our redemption, and God the Holy Spirit and our sanctification. The PRCA also stand in the line of the great Protestant Reformation of the 16th century, when by God’s might and mercy the church was re-formed according to the Word of God and restored to its pure doctrines and practices. We openly and gladly embrace the Reformed Faith with its emphasis on the absolute sovereignty of God over all people, events, and things and on the absolute sovereignty of His grace in Jesus Christ, saving, preserving and glorifying the people He has chosen in Him before the foundation of the world. This glorious gospel is summarized especially in the three great Reformed creeds we maintain: The Belgic Confession, the Heidelberg Catechism, and the Canons of Dordt. The PRCA also unashamedly embrace our own distinctive doctrines and practices, as the Lord has been pleased to lead us through controversy and battle for the truth in our history. We declare and defend especially the truth of sovereign, particular grace overagainst the teachings of common grace and the truth of God’s sovereign, unconditional covenant of grace with His elect people and their spiritual children overagainst the teaching of a conditional covenant and a general promise of salvation. With firm conviction we believe these truths have important implications for the Christian life and for marriage and home life. Consequently, we also emphasize the godly, antithetical character of the Christian’s life and the life-long bond of marriage. According to the precepts of God’s holy Word and the principles of our Reformed, Christian faith we practice corporate worship twice each Lord’s Day (Sunday). This obedient and joyful worship is simple, reverent, centered on God, and based on His Word. Our worship services focus on the Lord of glory Who is worthy to be thanked and praised (Rev.4:8-11), and we use His prescribed means to do this – singing, praying, giving of offerings, and the reading and hearing of His Word. Especially do we stress the priority of the preaching of the holy gospel of Jesus Christ, with messages marked by careful and plain explanation of the holy Scriptures for all ages. Such preaching, we believe, is God’s chief means of converting sinners and building up His church (Rom.10:17). Providence Protestant Reformed Church began in September, 2007 as a daughter congregation of Faith PRC in Jenison with 27 families. We formed as an independent congregation in June of 2008 with those 27 families. Since then, through the Grace of God, we have grown to 34 families and look forward to continued growth of our church family. We are a church that is made up of all ages. While we have many young children and families, we are also blessed with the wisdom of time and experience in other members. The mixture of ages has helped to form a unique, tight knit group of believers. We hold to distinctive Reformed Principles with The Holy Scriptures as our guide in worshipping and serving the one True God. To learn move about our beliefs please visit www.prca.org. Our church is a vibrant, busy community of believers who are committed to serving our Lord together. Our Sunday services are well attended and the fellowship afterwards is always rewarding. 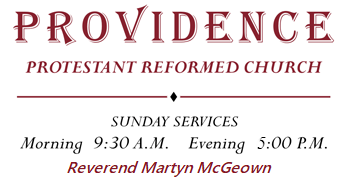 To learn more about Providence and the Protestant Reformed Denomination, please go to the links on the left.